I have written a few articles on Samba here on Ghacks. And most people know how to connect to Samba shares via Windows. Generally speaking (when all is set up correctly) it's just a matter of opening up Explorer and entering \\ADDRESS_OF_SAMBA_SERVER\SHARENAME to get to your Samba shares. But what about in Linux? How do you go about connecting to Samba shares with the same operating system that is running the Samba server? One would think that an easy task. It actually is, once you know how it is done. And in this article I am going to show you two different ways of making the connection to your Samba server. You will need to have a working knowledge of how the Samba server is set up as well as a username/password configured on the Samba server. There are also a few steps to take on the desktop for one certain method of connection. The two methods I will describe are: Using GNOME's Connect To Server dialog and the command line. The latter will be used to show you how to set up auto mounting for Samba. If you take a look at the GNOME Places menu you will see an entry labeled "Connect to server...". This is what you want to use in order to connect to your Samba server. When you click on that a new window will open. 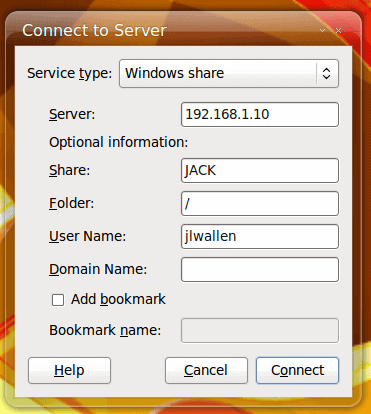 From the Service type drop-down select "Windows share" (see Figure 1). When you select that entry some of the configuration options will change. As you can see (in Figure 1), I have entered the necessary options to connect to a Samba server on my internal network. You will want to replace the information so it reflects your needs. The only tricky bit of information might be the Folder entry. If you are connecting to the root directory on the share you will not need to enter anything there. Say, for instance, you share is /media/samba/user. If you want to connect to that directory leave the Folder entry blank. Say, however, you want to connect directly to a sub-folder within that share - you can enter that folder here. This, of course, isn't needed because you can always traverse the sub-directories with simple navigation. You can also choose to add a bookmark instantly, from in this window. Once you have all of the information entered click Connect and you will be greeted with a new window that requires you to enter a password. Also, if you do not supply a Domain name in the previous window, you will be required to enter it here. You can also set this up to remember your password either until you logout or until, well, forever. Once you have entered the password/domain click the Connect button and a new Nautilus window will open inside of your Samba Share. Now we're going to use the command line to accomplish a similar goal. The biggest difference is that we are going to actually mount the Samba share into another directory, very much the same way we would mount a second hard drive. Where SAMBA_SERVER_ADDRESS is the actual IP address of the Samba server. You should see output similar to that shown in Figure 3. SAMBA_SERVER_ADDRESS is the IP address of the Samba server. SHARE is the share name. USERNAME is the username to connect with. Where SAMBA_SERVER_ADDRESS is the IP address of the Samba server and SHARE is the share name. You can ensure this works by issuing the command mount -a which should mount your Samba share. You should now have an auto-mounting Samba share - or the ability to easily connect your GNOME desktop to a Samba share. Samba is a very powerful tool that not only can share files with Windows machines, but with Linux machines as well. Great write up. Thanks for explaining this. Great tutorial, been wondering how to do this for an AGE. I want to thank you for your great article. This article did for me what Synology Disk Stations Customer Service, could not do. Thanks a lot, and please keep the great work going. Thank you so much Jack! I am a new Linux user, and could not connect to my router’s sbm share. your article help me solve this issue. Samba is on Linux server and windows users connect just fine. Connecting from Linux machine is also easy via file browser like this smb://login@server/share/ But i also want to connect via terminal. How do i do it? For some reason it mounts the share(even though cifs is used) but doesn’t grant me access to a folder.